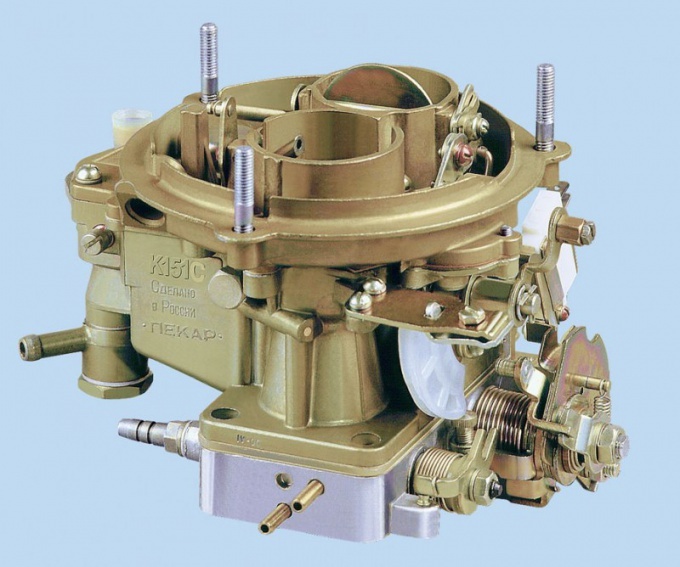 Carburetor K-151, widely used on the vehicles are quite reliable and requires minimal maintenance associated with flushing, cleaning and adjustment. During the process of adjustments of the device remember that the wrong actions can cause faulty K-151. Carb adjusting is performed without removing it from the engine. To adjust the float mechanism remove the cover of the carb. Rubber blower to remove about 25% of the float chamber fuel. Then install the crankshaft of the motor to a position not interfering with the fuel pump and start manually to pump up gasoline, watching the increase in its level in the chamber. Stop pumping at the moment when this level stabiliziruemost. Measure the depth of the float chamber caliper. It needs to be 21.5 mm (ideally) or 19-23 mm (non-critical). To increase the fuel level with a screwdriver pry up the tab of the float. To reduce fuel fold it down, holding the float with the other hand. After bending of the reed, re-check the fuel level in the float chamber. Adjustment combine with the regular cleaning and flushing of the carburettor. To adjust performance of the accelerator pump, remove the carburetor from the engine. Fill it with fuel and set the funnel over a beaker. Fully open the throttle and hold of the open for 3-5 seconds, then close for 1-2 seconds. This operation repeat 10 times in a row. The volume collected in the beaker of the fuel should be close to the guidelines specified in the Datasheet of the carburetor. Performance accelerator pump adjust rotate the adjustment needle on a drainage channel. To reduce performance turn it to increase – wrap. Adjustment of starting system do without removing the carb from the engine. To do this, slightly open the throttle, turn until it stops and fix it with wire or rubber band the lever control trigger system. Release the throttle and measure the clearance between its edge and the wall of the mixing chamber. It needs to be 1,5-1,8 mm. If necessary, adjust the gap by loosening the locknut and turning the screw-emphasis flat screw on the throttle lever. Change its position each time not less than a half turn. When final tightening the locking nut, the plane of the screw head should be perpendicular to the plane of the Cam. Measure the clearance between the levers on the axis of the air valve. When rotated to lock the lever trigger system and a fully air flap is open it must be 0,2-0,8 mm. the carbs of the old editions, adjust the gap by rotating the threaded head of the control rod of the launcher system. On a more modern carburetors, adjust the clearance by turning the screw of fastening of pads on the Cam trigger device and moving it up or down, followed by tightening of the screw. Adjust the gap on the lower edge of the air vent in the presence of vacuum in the cavity of the diaphragm mechanism and when fully vtyanuta stock starter. For this fixing method described above, the control lever starter system, press the top l-shaped rod of the diaphragm, simulating a vacuum. The gap between the edge of the air deflector and the wall of the air cap should be 5-7 mm. For its correction remove the screw that secures the half duplicera lever of the starting device in the top cover of the carb. Changing lever to the choke position, tighten the screw and recheck the gap. Remove the air filter, start the engine and warm it up to normal operating temperature. Slightly pushing the gas pedal fully pull on the lever of choke control. With a screwdriver open the choke up all the way and make sure the engine is running at rpm 2500-2700 rpm to adjust the speed loosen the lock nut on the adjustment screw is a stop for the throttle lever primary camera. To increase the frequency of rotation of the crankshaft turn the screw to lower – wrap. After completing the adjustment, tighten the lock nut. In addition, this adjustment can be performed without the rotation of the adjusting screw-lock. To do this, gently bend the throttle lever suitable pliers.